Martin Brundle after the Indian race called him 'the most valuable man in Formula One'. And not for nothing, last weekend he increased his personal count of world championship crowns to 20, claimed in a mere 22 season spell and with three separate teams. He's not a driver, nor is he a team boss. 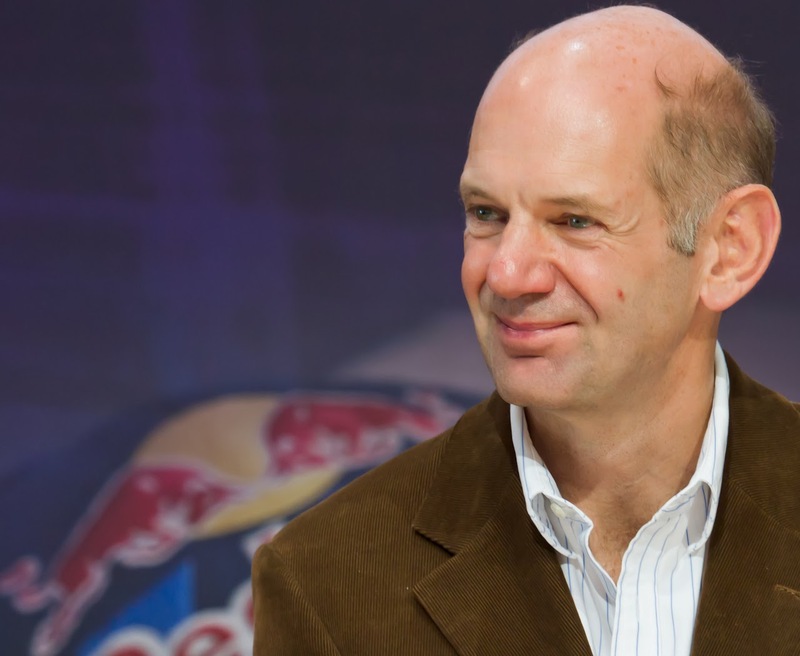 Heck with this attempt to create tension, you've probably long since worked out who I'm on about: one Adrian Newey, Red Bull's Technical Director. The days of an F1 car being the creation of one guy at a drawing board are long in the past; modern design teams encompass scores of people and Newey more than anyone resists the idea that - at Red Bull or anywhere else he's been - it's all about him. But even with this the magic dust that Newey sprinkles is obvious; for various reasons he more than deserves to detain us for a few paragraphs. Of course, I was cheating ever so slightly with the championships total above, in that Newey unlike a driver can aim for two crowns per year (drivers' and constructors'). But close to a 50% strike rate is not to be sniffed at - not even Schumi matches it (though he wasn't too far off pre-comeback). And even the equivalent totals of other revered technical heads from F1 history pale somewhat: Colin Chapman has 13 championships; Mauro Forghieri 11; Ross Brawn 16; Rory Byrne 14. It doesn't seem hyperbole to state that Newey is F1's best and most remarkable technical brain ever. Bar none. And his title total has been accumulated despite a conspicuous fallow period. It seems scarcely believable, but for the whole of the 2000-2009 decade for Newey there was not a single title. There were of course mitigating circumstances: he was up against the mighty Ferrari 'dream team' for much of it; moreover Newey and McLaren were hardly helped during this period by many of Newey's ideas being shot down by the FIA, some before they'd even been raced (including something akin to KERS long before it became famous). This was the same FIA that just so happened to have a close relationship with the Scuderia at the time, as well as a highly adversarial one with McLaren's head honcho Ron Dennis. We found out some time later that the Italian team had a technical regulation veto too (and indeed still does). Not that I draw conclusions from this, you understand. But even this wasn't the whole story: Newey at McLaren despite the initial championship success together never seemed hand-in-glove: the Woking team famous for reliance on its systems, its matrix, its empiricism; some might say over-reliance. But whatever is the case there wasn't always space within it all for the full breadth of Newey's inspiration. While all of this was going on at certain points Newey appeared ever so slightly washed up; speculation about him losing his motivation, of going off to the America's Cup, lingered (though if he was feeling exasperated it would have been understandable, given everything). But Red Bull's Christian Horner - aided by David Coulthard - knew that the talent was still in there, it was simply a matter of giving him the circumstances wherein it could be exploited. They approached him in 2006, offering a chance to be an architect of a bold new project, an up and coming team with plenty of money and ambition; one wherein Newey could build a technical department almost from scratch and in his own image. Newey was sold on it. Initially, there looked to be little progress in results as Newey built, but with the structure in place a major set of rule changes for the 2009 season was the opening he needed. He and his team produced the RB5 - a classic - and we know the rest. And but for being (arguably) shafted somewhat by the double diffuser in 2009 - something that still rankles with the Red Bull team - Newey's cars could have a 100% record in claiming world titles under the broad set of rules that have been in place over the five year period since. Quite something. In a lot of ways Newey seems something of a throwback: still a draftsman in the age of the computer; still a conceptualist at a time when most Technical Directors are delegators and organisers. But looking at Newey's succession of championship winning cars at Williams, McLaren and Red Bull alongside each other gives clues as to one of the secrets of his success. Clear evolution can be seen from design to design; radical breaks are minimal (especially compared with some of his rival teams' outputs over the same periods). He seems to embody cycling's Dave Brailsford's celebrated 'incremental gains' maxim, making cumulative, sometimes small, yet always significant and regular progress on a winning concept which ensures that he stays a few steps ahead. And while Newey's capacity for innovation is concentrated on again it's not the whole tale: mod cons like the active suspension that featured on his dominant Williams of 1992-1993 and the blown diffuser mastered on his recent Red Bulls had already existed, and been raced, in F1 years previously. Newey's genius instead largely lies in, rather than necessarily doing things differently, doing things much better.